Cut the avocado in half and take out the soft part and cut it into chunky size pieces. Squeeze some lemon on top, so it won’t turn brown. Put the pieces in a medium bowl. 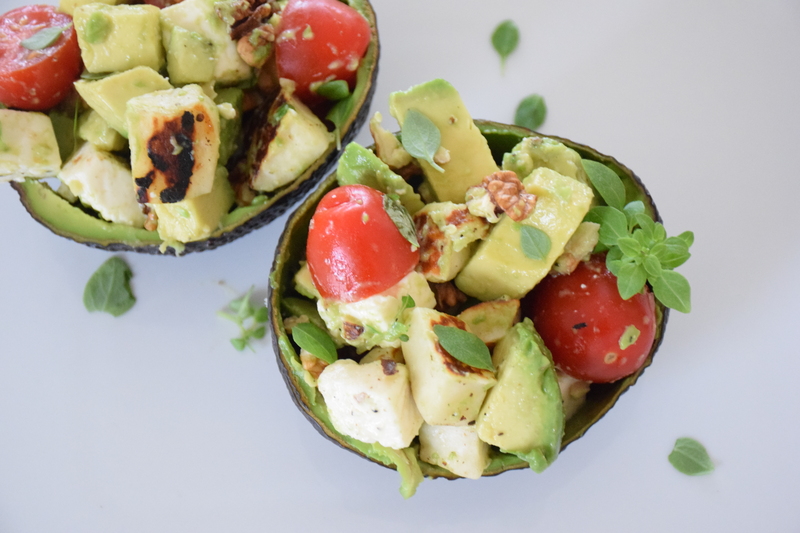 Cut the cherry tomatoes in halves and add them to the avocado bowl together with walnuts. Cut the halloumi cheese into chunky size pieces and bake for a few minutes each side in a non-stick pan. Once ready add the avocado bowl. Разрязваме авокадото на половина и махаме меката част. Изтискваме малко лимон отгоре, за да не потъмнее. Нарежете чери доматите на половина и сложете при авокадото, заедно в орехите. Нарежете халумито на големи кубчета и го изпечете на тиган за няколко минути на тиган без мазнина. Накрая нарежете и сиренето на кубчета и го добавете при другите продукти. Добавете малко босилек и черен пипер. Разбъркайте добре и напълнете в кората на авокадото. Аз сол не добавям, защото сиренето и халумито са доста солени. I’ve learn this post and if I could I wish to counsel you some interesting things or suggestions. I want to express my thanks to the writer just for bailing me out of such a incident. Because of exploring throughout the search engines and getting views which were not beneficial, I figured my life was over. Being alive devoid of the solutions to the difficulties you have fixed all through your main short article is a critical case, and ones that could have badly damaged my career if I hadn’t come across the blog. Your main knowledge and kindness in controlling every item was excellent. I don’t know what I would’ve done if I hadn’t come across such a subject like this. I’m able to at this time look ahead to my future. Thanks a lot so much for your skilled and result oriented guide. I will not be reluctant to refer your blog to anybody who requires assistance about this topic.